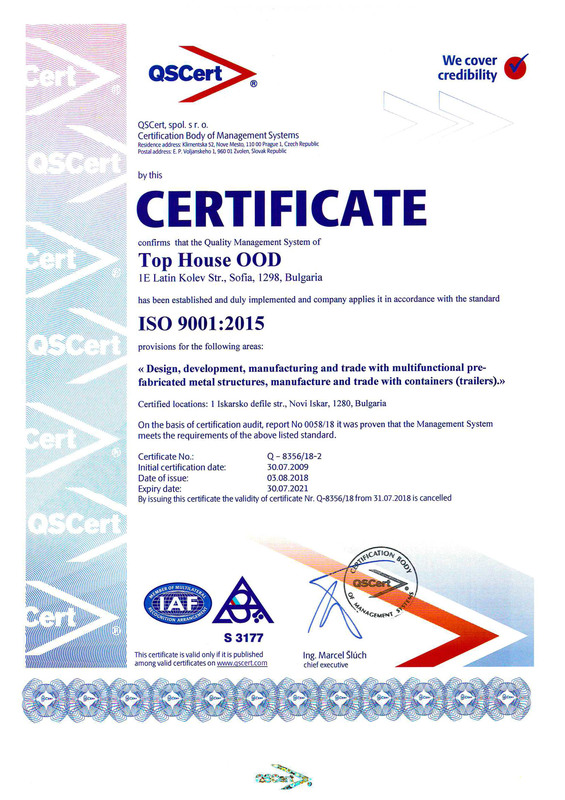 Top House is a leading Bulgarian company in the field of manufacturing and sales of multi-purpose metal containers, modular offices and housing facilities. Every month we manufacture more than 5000 sq. m of metal structures. Top House operates its own modern manufacturing facility with a total area of 20 000 sq. m in the city of Sofia, Novi Iskar, kv. Slavovtsi, str. Iskarsko defile 1 and has several showrooms in the cities of Sofia, Plovdiv, Varna, Bourgas, as well as abroad in Munich (Germany) and Salzburg (Austria). In these showrooms, samples and catalogues of all our products are exhibited to our customers. - wide-ranging variety of more than 150 types of basic multi-purpose containers, which provide solutions for mobile offices, stalls, shops, exhibition booths, modular kiosks, technical-purpose containers, refrigerator containers, sanitary containers, guard booths, and prefabricated movable modular houses, or for any other purpose according to your ideas and projects. - excellent ratio "technical parameters-price"
We at Top House strongly value our clients'''' opinions and we always aim at being loyal and creating excellent working relationships, thus winning the trust of a number of large, medium and small-sized civil contractors and business companies, private individuals, as some of them are:Octoberfest, Kärcher, Liebherr, Mercedes , Meggle, Müller, Glavbolgarstroy, SK-13 Patstroy, Hydrostroy, Geotechmin, Lukoil Neftochim Bourgas, Rompetrol, Port Varna, Port Bourgas, Holcim, Bulgartransgaz, Bulgaria Air Charter, Sopharma, Sigma Security, New Bulgarian University, University of National and World Economy, Technical University, Agricultural University of Plovdiv, Trace Bourgas EAD, Bulgarian Posts, Energoremont Kozloduy, Metro Cash&Carry Bulgaria, Business Park Sofia, M-Tel , BTC, etc. 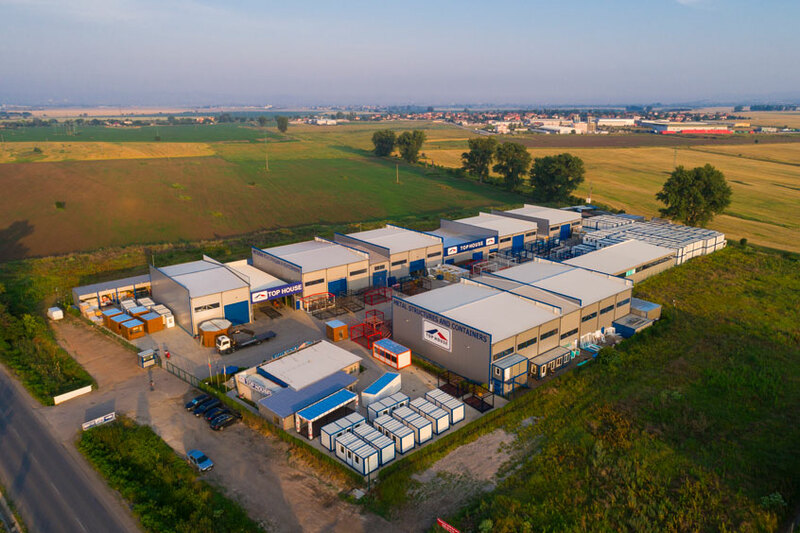 Our innovative spirit and continuous efforts to implement the latest EU and worldwide trends in the manufacturing of multi-purpose containers have aided us in achieving success and realization on foreign markets in countries as Romania, Macedonia, Greece, France, Germany and Austria.